The population of the San Luis Basin region of northern New Mexico is growing. Water shortfalls could have serious consequences. Future growth and land management in the region depend on accurate assessment and protection of the region’s groundwater resources. An important issue in managing the groundwater resources is a better understanding of the hydrogeology of the Santa Fe Group and the nature of the sedimentary deposits that fill the Rio Grande rift, which contain the principal groundwater aquifers. The shallow unconfined aquifer and the deeper confined Santa Fe Group aquifer in the San Luis Basin are the main sources of municipal water for the region. The U.S. Geological Survey (USGS) is conducting a series of multidisciplinary studies of the San Luis Basin. Detailed geologic mapping, high-resolution airborne magnetic surveys, gravity surveys, an electromagnetic survey called magnetotellurics (MT), and hydrologic and lithologic data are being used to better understand the aquifers. This report describes a regional east-west MT sounding profile acquired in late July 2009 across the Taos Plateau Volcanic Field where drillhole data are sparse. Resistivity modeling of the MT data can be used to help map changes in electrical resistivity with depths that are related to differences in rock types. These various rock types help control the properties of aquifers. The purpose of this report is to release the MT sounding data collected along the east-west profile. No interpretation of the data is included. 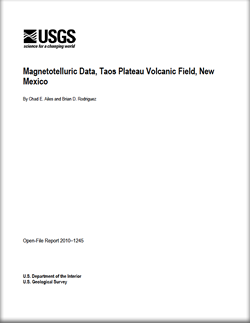 Ailes, C.E., and Rodriguez, B.D., 2010, Magnetotelluric data, Taos Plateau Volcanic Field, New Mexico: United States Geological Survey Open-File Report 2010–1245, 65 p.